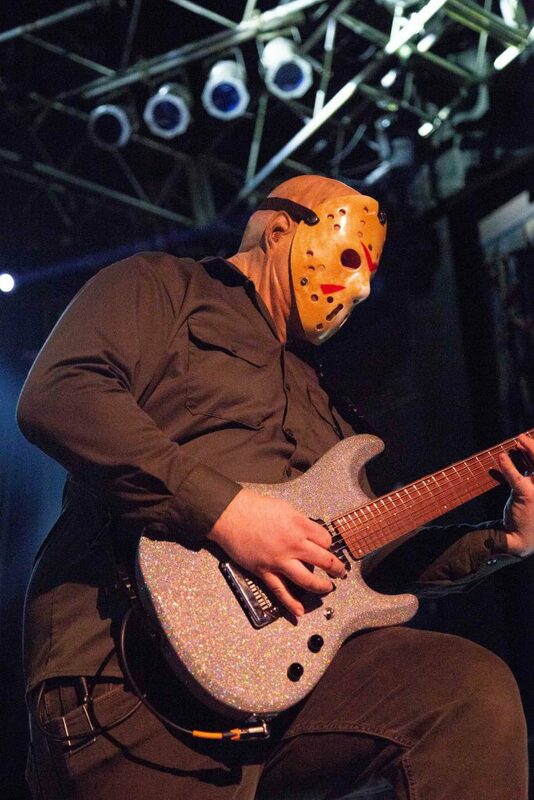 Jason Voorhees crosses the stage, guitar in hand, as he is followed by Jigsaw, little Georgie, and eventually Freddy Krueger. 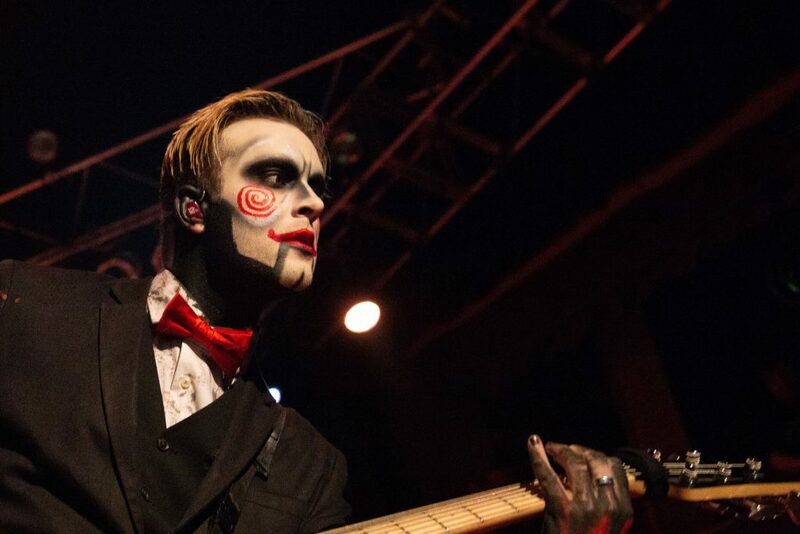 It’s a head-banging horror show, and the fourth time that I’ve seen “Ice Nine Kills.” For those who don’t know, the name of this costumed, metalcore band is a reference to a deadly substance in Kurt Vonnegut’s novel Cat’s Cradle. 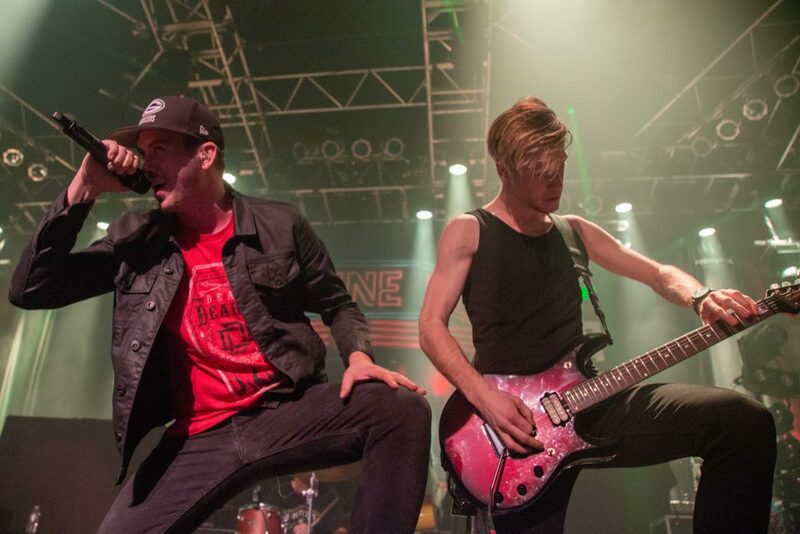 Nearly all of the band’s songs are inspired by literature or film, and even though they were only the second opener, Ice Nine Kills easily performed above all three other bands including the headliner, Atreyu. Sleep Signals, a lesser known, run of the mill metal band from Minnesota, opened the show with a few, generic riffs. Even though the songs ran together, the new comers certainly gave it their best. Lead singer Kyle Hanson’s clean vocals definitely had potential, but innovation from the rest of the band was lacking and fairly unimpressive. 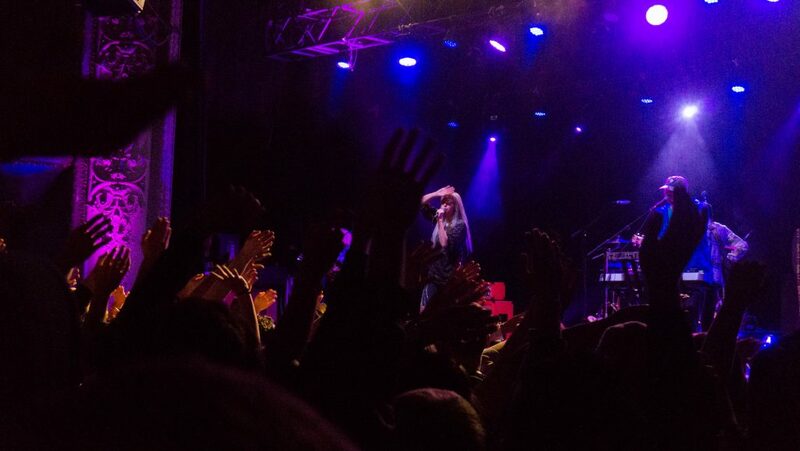 But that’s nothing unusual for the first opener at a concert, and despite this, Chicago’s House of Blues was already packed to capacity. Just before Ice Nine Kills walked on stage in their Halloween get-up, the house was as packed as it was going to be all night. Sweating metalheads crowded the venue wall to wall with barely an inch to breathe, and even the walkways between the pit and the bars were inaccessible from the sheer density of people. 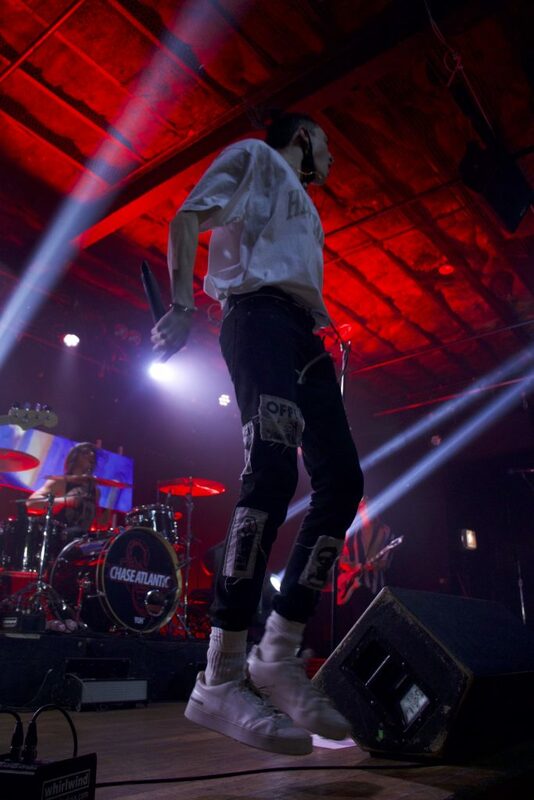 As the intro to their first song, “The American Nightmare,” faded out, and lead singer Spencer Charnas released a manic howl into the microphone, the wooden floors shook with the earthquake of energy that was the audience. 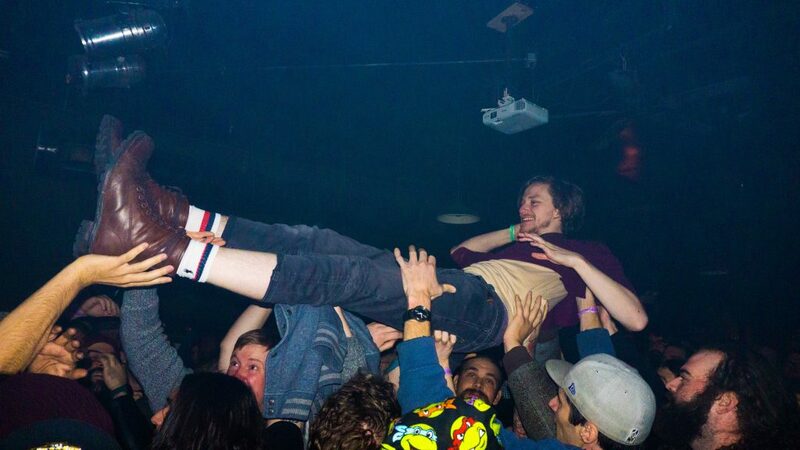 Throughout the set, crowd surfers continuously flew across a swarm of fans as the crowd became a living organism of moshing, sweat, and beer. 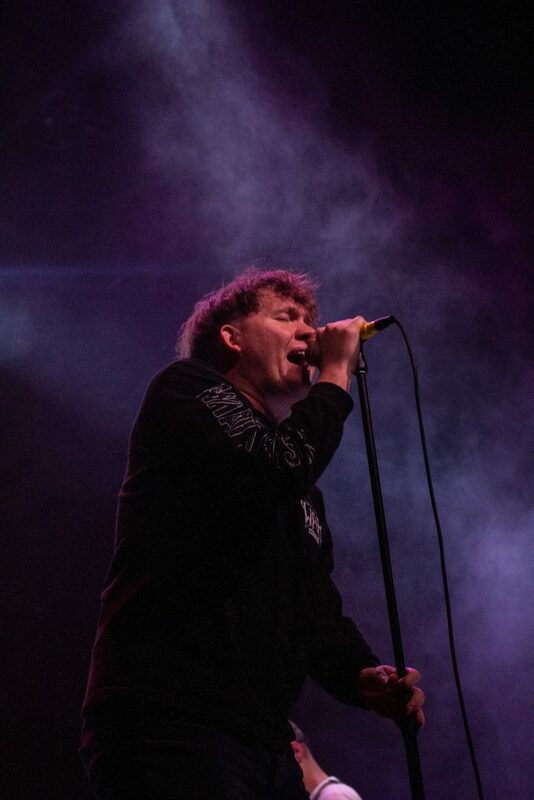 While the band played more songs than I would prefer from their newest album, The Silver Scream, they still returned to their older, heavier work. 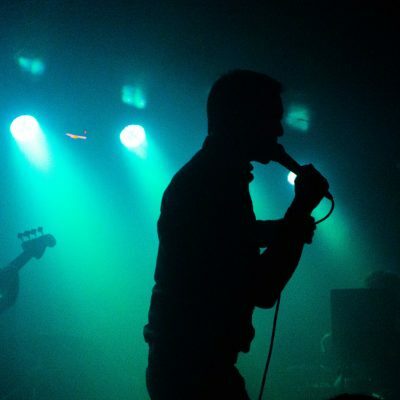 When the impressively fast-paced yet brutal breakdown of one of their most popular songs, “Communion of the Cursed,” blasted from the speakers, Charnas jumped into the crowd to stand on top of their outstretched hands in an acrobatic feat that I had witnessed many times at their other shows. This might have been the fourth time I had seen Ice Nine Kills, but it was just as incredible and impressive as the first. Once Ice Nine left the stage, so did much of the crowd, and I was thankful for a little more breathing room within the suffocating pit. 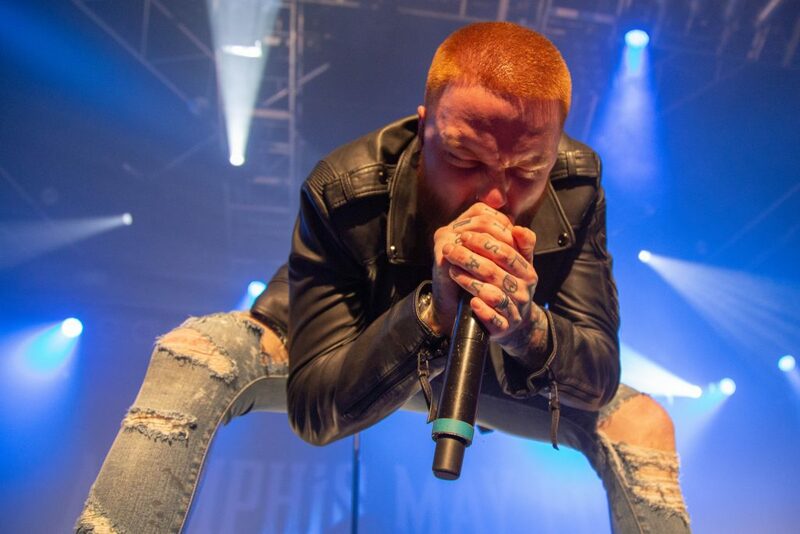 However, Memphis May Fire, the third opener and another “core of the genre” metal band, proved to be a disappointing follow up. The band’s campy and uninspired choruses and four chord structure felt like pop music disguised as heavy metal, and I felt myself and much of the crowd grow bored as the set dragged on. 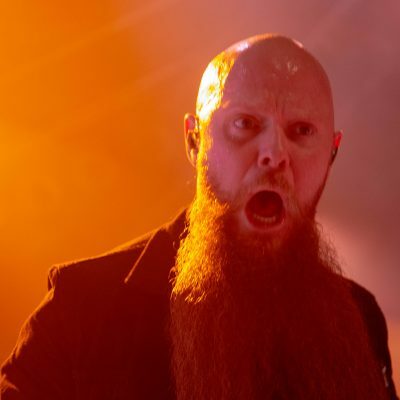 The mosh pit was virtually nonexistent, (a rarity at a metal show), and the audience stood relatively still as the scrawny lead singer hollered clichés from the safety of the stage. Even when they played their most popular song, “The Sinner,” as their closer, only a handful of devil horns shot into the air. An older and very drunk woman turned to me halfway through the set as she slurred her words, “Atreyu is better. I promise Atreyu is better!” She didn’t have much persuading to do, as Memphis May Fire was definitely the weakest link of the night. Finally, the floor to ceiling drapery of Atreyu’s skull symbol appeared on stage, and stacks of stage lights flashed blue as the five-piece band made their entrance. As one of the most well-known names in metal, I had high hopes for the more established group: I was sorely disappointed. While certainly not as lackluster as Memphis May Fire, Atreyu’s sound and performance fell short of expectation. At this point in the show, a noticeable amount of fans had left the venue, and those that had stayed were so visibly unimpressed that I actually felt bad for the band. Rather than sticking to their older, metal sound, Atreyu had all but gone pop punk. Their first song, “In Our Wake,” set the tone for most of the set. It’s upbeat, poppy chorus and complete lack of guitar work was indistinguishable from most of Blink-182’s songs. Not that Blink-182 is a bad band, but Atreyu was simply a very confused and poor version of them. Atreyu had a classic case of regression, or “old people trying too hard to act young.” Vocalist Alex Varkatzas hopped around stage with out of style frosted hair and a flimsy silver tie. 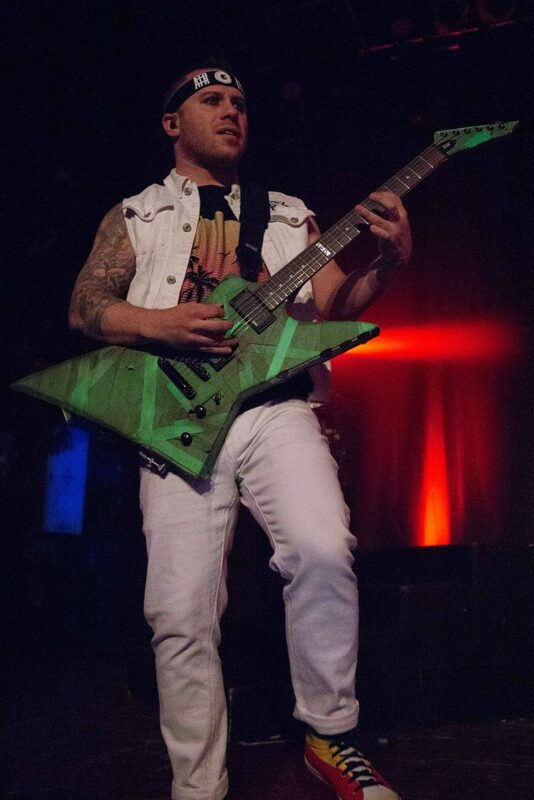 36-year-old guitarist Dan Jacobs sported emo-style eyeliner and a black Mohawk. But even though their appearance was youthful, their energy was still lacking. Plenty of older bands successfully manage to appeal to both younger and older crowds, but Atreyu is unfortunately not one of them. Before either Liz Cooper and the Stampede or Phosphorescent took the stage Friday night at the Vic, there were two cardboard cutouts posed by the mics. A part of LC’s team (probably the videographer, which will come up later) pulled out a feather duster and made a show of dusting the cutouts before whisking them offstage. After this slightly confusing performance, lead singer/guitarist Liz Cooper, bassist Grant Pettyman, and drummer Ryan Usher appeared. Their music, in and of itself, was dynamic. Their sound has a heavy vintage influence, drawing from the old-school rock of the 60s and 70s, along with more contemporary pop earworms. Their infectious basslines, coupled with Cooper’s floating vocal, made for a really broad sound for a three-piece band. The best of their set was “Sleepyhead,” a fun, light song with a great bass line, though the slower “Motions” let Cooper’s vocal talent shine. On the level of the music, Liz Cooper and the Stampede were remarkable. But throughout the performance, there were odd moments of incongruence and little ‘bits’ that felt less like an inside joke and more like a ploy to be memorable. 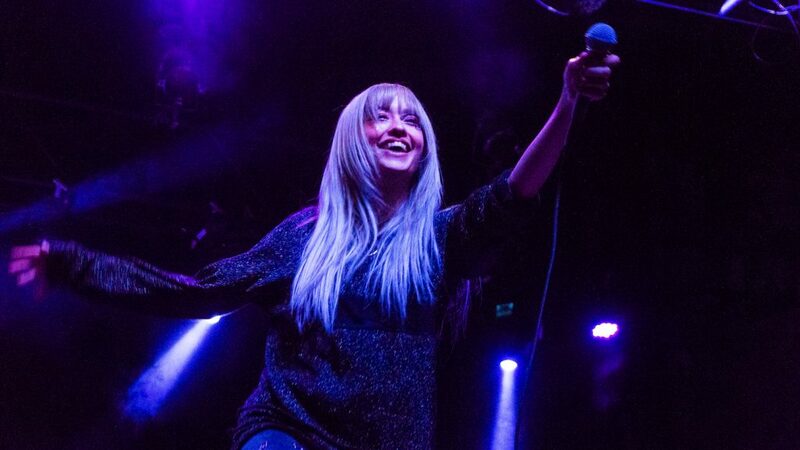 LC’s music spoke for itself–they aren’t a band who needs to create a spectacle in order to be worth discussing. There were moments of silliness and sweetness, like when Usher pulled out maracas shaped like bananas. But then when he and the other group members staged strange dance moves, or when cardboard cutouts began the performance, it felt like they were trying to compensate for an issue that wasn’t even there. The effort didn’t stop at small gestures either. The same man who dusted and then removed the cutouts jumped out on stage during the final song. He ran from one side of the stage to the other, danced, and then grabbed a video camera to film the band. These moments were odd and incompatible with the solid music the band played, which would have shone beautifully on its own. Phosphorescent followed. The setup was wide-ranging, with an extra percussionist, organist, and pianist. All these different musicians meant that the indie rock outfit could fully render their sound, including the airy, effect-laced guitar parts. “New Birth in New England” let the organ come through, while tempering the more ethereal guitar parts with lead singer Houck’s more rusty voice. “The Quodtidian Beasts” was another great moment for the guitar effects. A similar sound could probably be achieved with synths, yet the more traditional band setup let the rhythm guitar pull double duty. It could back Houck’s lead, or create the rising and falling chords that make Phosphorescent’s sound distinctive. When they began “Christmas Down Under,” Houck started having trouble with his guitar. During an intense solo moment, the audio cut out and it seemed like Houck was genuinely frustrated with his equiptment. He made a few rounds of the wires onstage and even tossed his guitar on the ground in frustration. 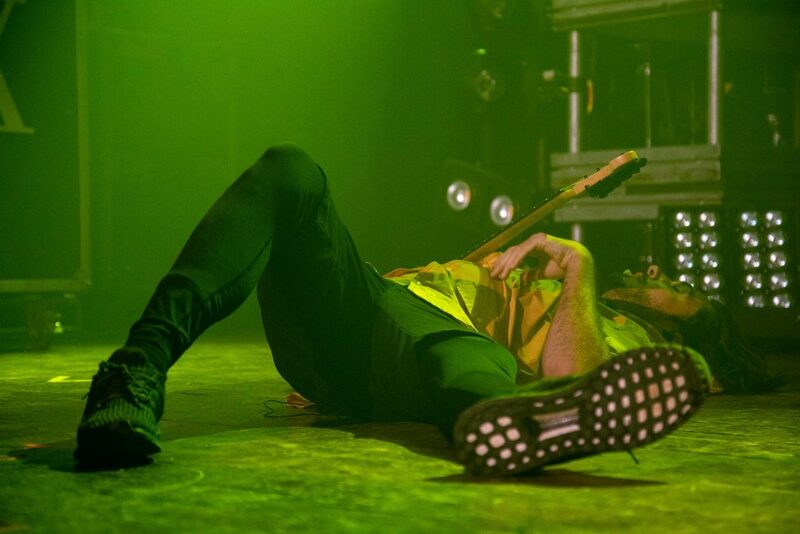 A few minutes later, after the song ended and his guitar seemed to be working, he joked: “This is the time on the tour where amps, voices, and guitars get broken” Despite this complication, the rest of the show continued without any technical difficulty. “Nothing was Stolen (Love Me Foolishly)” saw the more airy rhythm guitar ground the song in a more traditional sound, which made for a great end to the first part of the show. 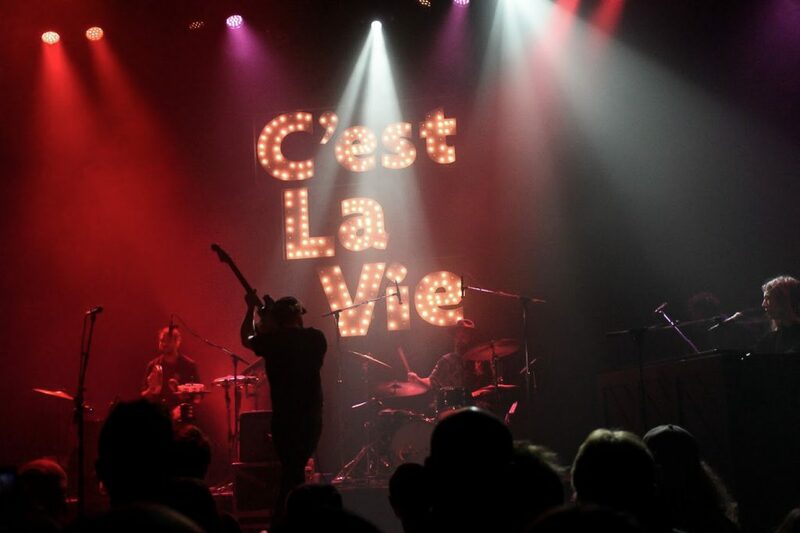 The encore saw Houck return to his start as a singer-songwriter, playing solo “C’est La Vie No. 2” and “My Dove, My Lamb.”The intimacy of these moments was awesome, but part of the wonder of the show was watching the whole group of musicians from the distinctive, recognizable Phosphorescent sound. 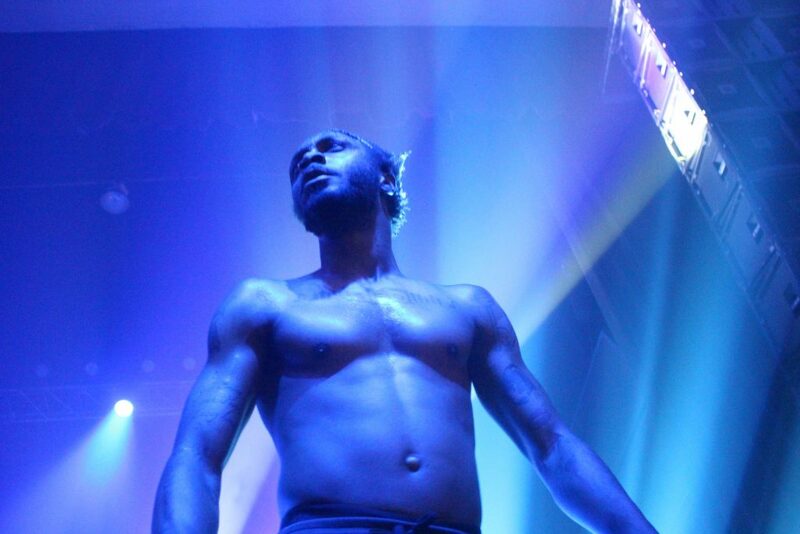 If you don’t want any exhilarating, euphoric, heart-pumping craziness in your life: Listen to JPEGMAFIA while your phone is muted so he at least gets the streaming money. 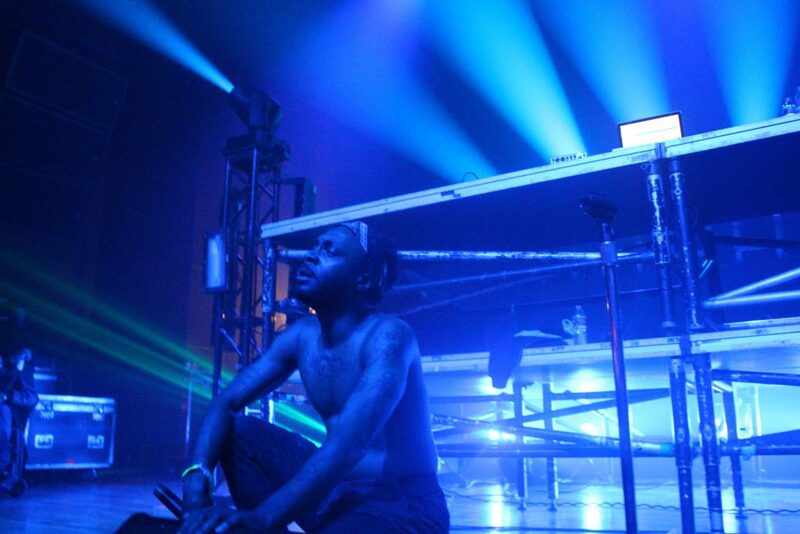 Performing at artist Danny Brown’s fifth annual Bruiser Thanksgiving, held the night before the holiday, JPEGMAFIA delivered his usual hyperenergetic performance. This is not to say anything about his performing style is ordinary. The man sings possessed. 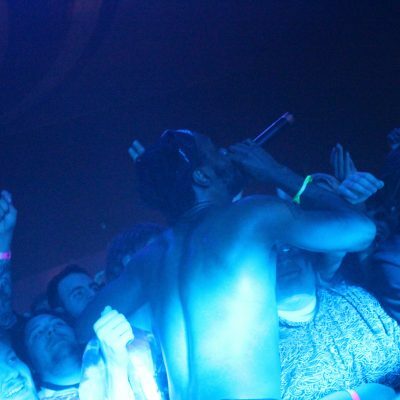 Shirtless, sweating, screaming: he convulsed with his music as though he were the wildest individual in a mosh pit. 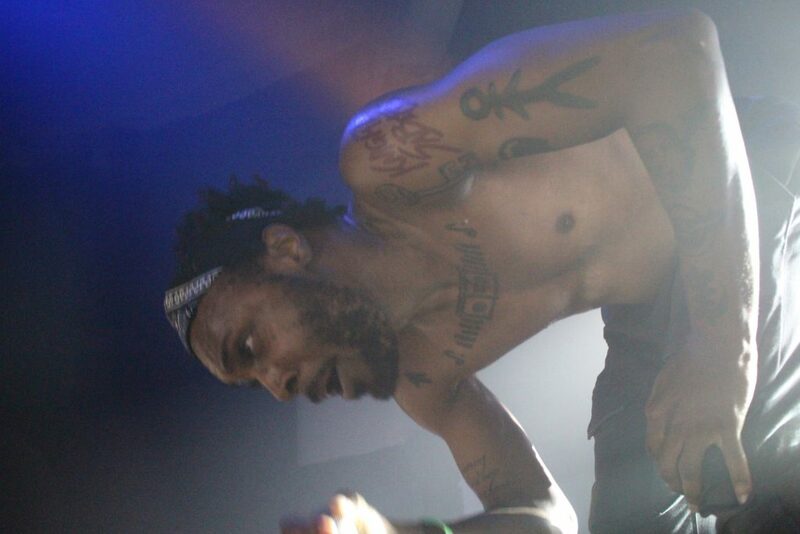 At one point in his performance, JPEGMAFIA even went into the audience and started his own mosh while rapping at maximum human volume. Topics of violence and politics are in no way new to music or rap, but Peggy uses them in a satirical, almost nihilistic way. On Veteran he makes fun of people with liberal arts degrees, while he himself has a master’s degree in journalism. During his freestyle, the same one that he admits to doing at each of his shows, he yells, “When Donald Trump dies we going throw a party!” On his track “Macaulay Culkin” Peggy raps, “Feminist, pistol whip your wife first, that’s chivalry.” Peggy is not a conscious rapper. If anything, he is a troll: laughing at our ideals, telling us we live in a fantasy world, telling us he does too. Amidst this craziness, Peggy won’t be anyone but himself. Some will think JPEGMAFIA is too much. His eccentric, self-produced, noise-rock-rap beats give him a canvas to throw an entire container of lyrical paint onto. It’s almost impossible to capture his pure energy without watching it yourself. 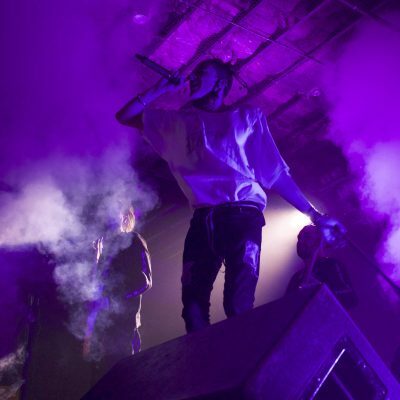 On a freezing Tuesday night, Chase Atlantic completely blew up the Bottom Lounge with an amazing performance. 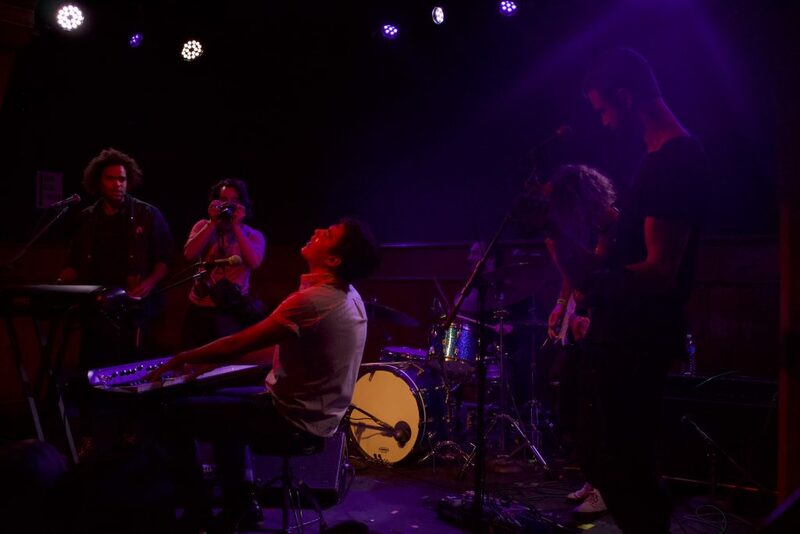 Even with a slipped disk in his back, singer Mitchel Cave delivered a fast paced, high energy set. Chase Atlantic is a band from Australia, made up of brothers Mitchel and Clinton Cave along with their long-time best friend Christian Anthony. Their music is a tasteful mix of R&B, pop and rock. Songs with catchy beats backed by Clinton’s saxophone make up their discography. After their set, I immediately knew why three girls I met traveled all the way from Georgia to see three of their shows. The show started off with first opener, R I L E Y, whose songs were mellow hip-hop/r&b beats. For an opener, the crowd was super engaged and interactive. 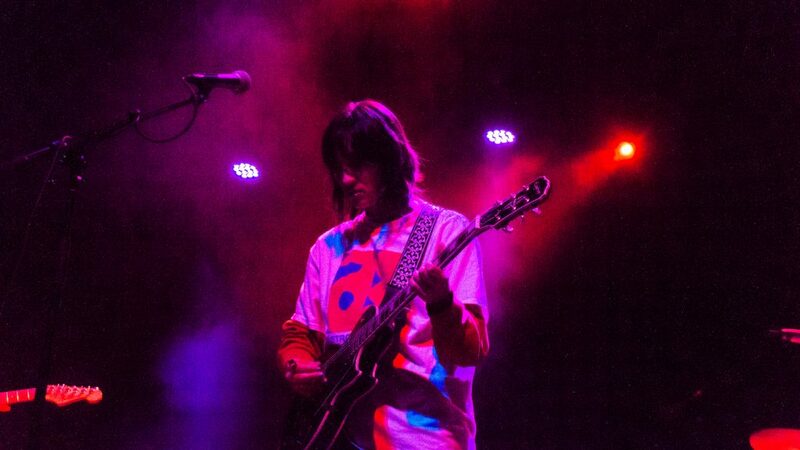 Then followed Cherry Pools, whose punk rock style contrasted to their very pop-like sound. 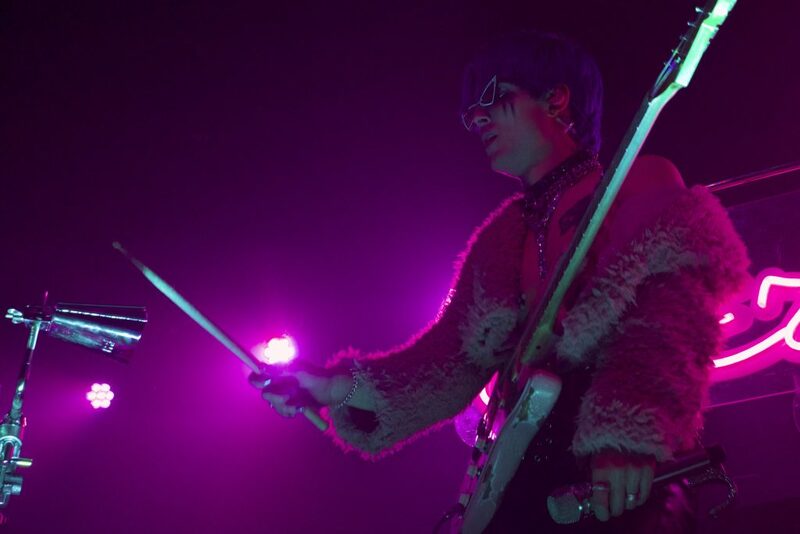 The lead singer had dark blue hair, chain necklaces and a spiked choker, wearing funky green glasses and a fuzzy jacket that he eventually shed. The guitarist was wearing a crop top and tight black jeans. I unfortunately could not see the drummer from where I was standing. At one point, the band played a fun cover of Michael Jackson’s “The Way You Make Me Feel.” Their overall set was very fun with catchy songs and great stage energy. 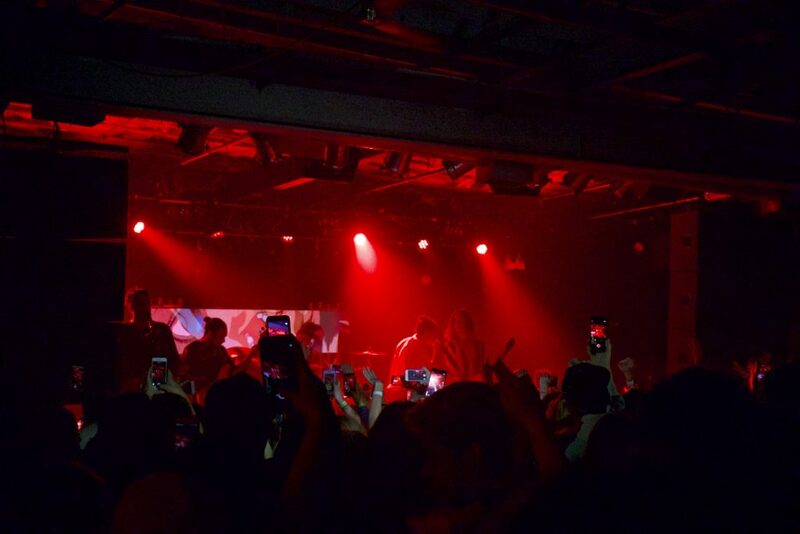 Then Chase Atlantic came and completely transformed the stage. They started with “Swim,” jumping around and hyping up the crowd with smoke machines bursting at the crescendos of the song. Although their music is mostly about girls, drugs and money (with a song literally named “Drugs and Money”), their songs are catchy and feel very deeply emotional. I fell in love with Chase Atlantic when I saw them live at Warped Tour this past summer. Their stage presence and energy transformed their music into an amazing rock experience, and I knew I had to watch out for them. Clinton’s sax solos and the band’s r&b beats take their music to a different place I haven’t heard rock music go before. 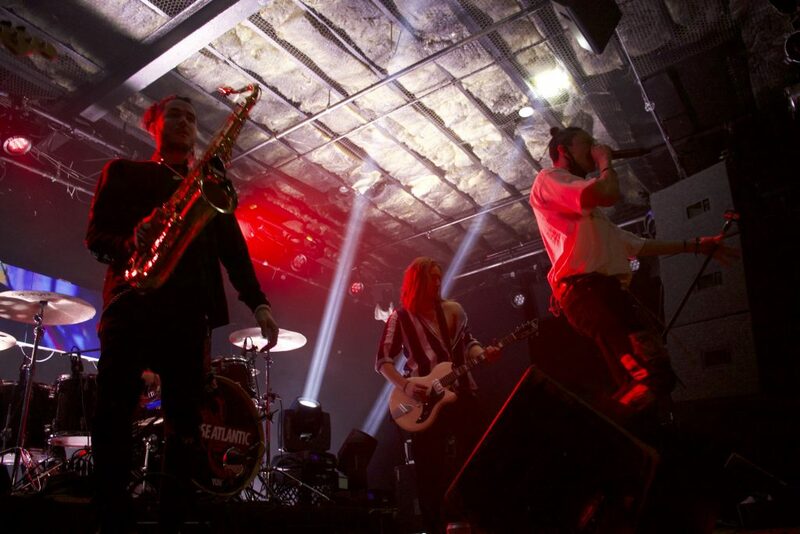 The guys played many popular songs from their recent album, Chase Atlantic (Except for “Cassie,” unfortunately). 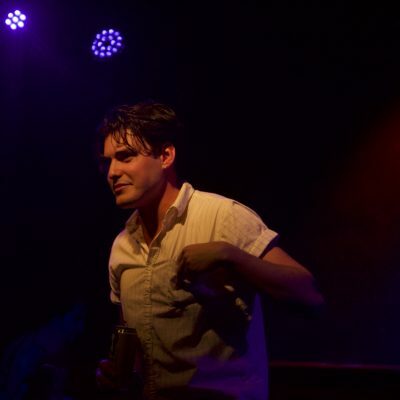 At one point, the band left the stage for a quick “break” and then played their new unreleased song, “Devilish.” One of my favorite parts of the show, however, was when Mitchel sang “Ozone.” Before he started, he remarked the song was special to him and went on to sing it with incredibly raw emotion. The band really knows how to take their audience through a range of emotions. The band’s on-stage chemistry was amazing as well. Christian and Mitchel constantly embraced each other throughout the performance. One girl threw a bra on stage and Christian jokingly picked it up and put it on Mitchel’s head. During “Okay,” their last song, both R I L E Y and Cherry Pools came out on stage to dance. Even during their slower songs like “Angeline,” Chase Atlantic had the crowd on high energy the entire time. I had a cramp from jumping and dancing so much. 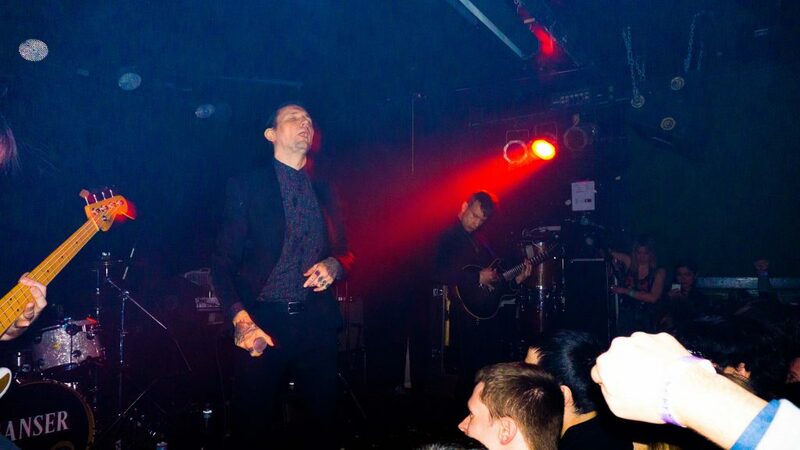 During “The Walls,” Mitchel remarked that this might be his favorite show of the tour. It was definitely one of my favorite shows of all time. I think – I’m going to try something new. I know show reviews aren’t supposed to be personal. They’re about the music, after all. 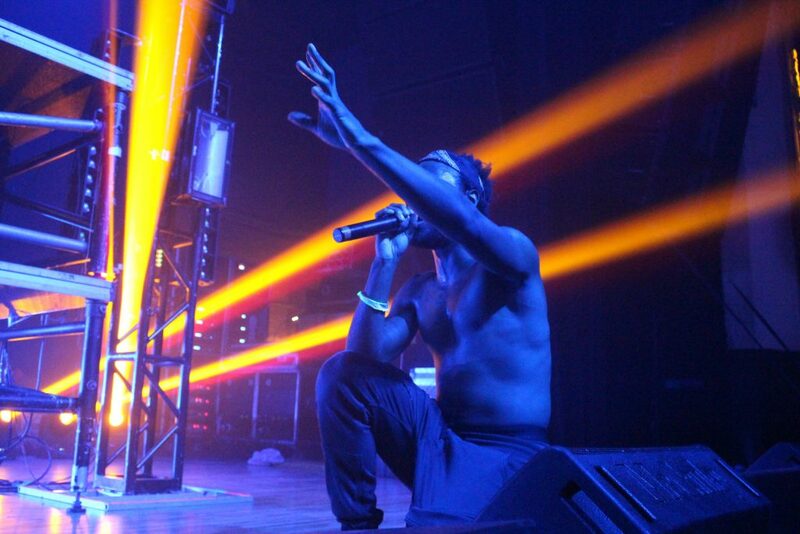 They’re about the artist’s stage presence, and their lights, and the atmosphere created by the crowd. But Carl Garsbo, the Swedish DJ and producer known as Kasbo, managed to pull out some emotions I hadn’t felt in quite some time. It couldn’t help but be personal. Kasbo and I go way back. His remix of Mutemath’s “Monuments” was the track of my junior year of high school, and even today he holds a special place in my heart. When Places We Don’t Know, his debut LP, came out in March of this year, I remember playing it on repeat for the entire next week. It’s still my go-to for something mellow and emotional to listen to. That’s a hard combination to pull off, mellow but emotional. For some crazy reason, Kasbo accomplishes both. Driving house beats, a blanket of reverb-y synths, and sparkling ornaments on his sound create a sound that echoes. It has depth, but stays light and optimistic. His lyrics are about finding oneself and leaning into the unknown, and about the highs and trials that come with young love. On Saturday, this music was perfect. After an exceptionally hard quarter of self-growth, all I wanted to do was get out of Evanston for Thanksgiving break. I hadn’t felt so low in a long time. But something told me to wait one more night and stay for Kasbo’s show. After feeling so connected to his music for so long, how could I not? My conclusion for the night: If you just want to feel good, or happy, or light and airy – this show is a staple. It will put a bounce in your step and lift you up. Places We Don’t Know translated perfectly into a live performance, with dreamy visuals and foggy lights. 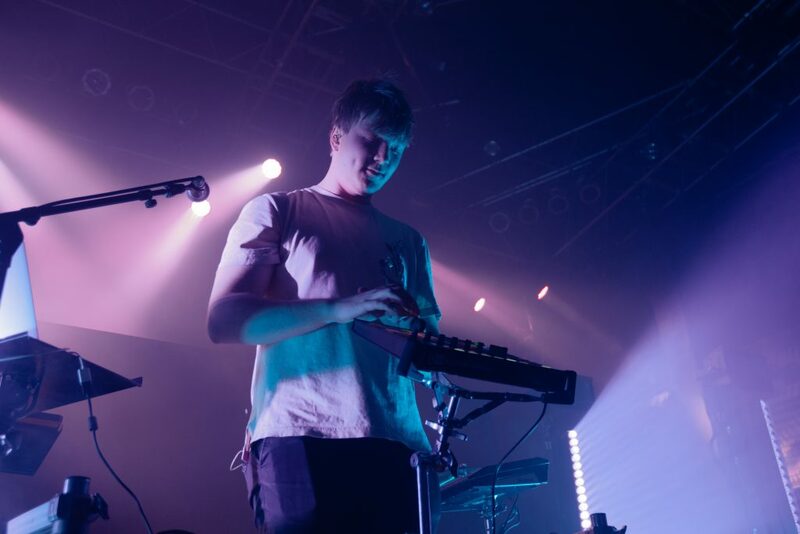 Music that felt like home to me became a literal home: Kasbo’s sweet, unassuming presence welcomed me into an ocean of sound, light and color. The show brought me from such a low to such a high in just an hour. While it was just a temporary relief, it gave me the energy to put myself on a plane the next morning and fly home to take care of myself. It made me hopeful, and, for just a little bit, the world felt so light and simple. It was exactly what I needed. I know this sounds more like a diary entry than a show review. I suppose it is, just a little bit. But if Kasbo can put me this deeply in my feels and make me want to TALK about it and TELL someone, then that is my sign to you that this show was something profound and special. I just want to share that. Daughters’ performance on Sunday night at Beat Kitchen was like watching a horror film without the ability to cover your eyes. I’d heard talk of their show being “visceral,” but I did not expect the cacophonic, angry, and primal experience that it turned out to be. 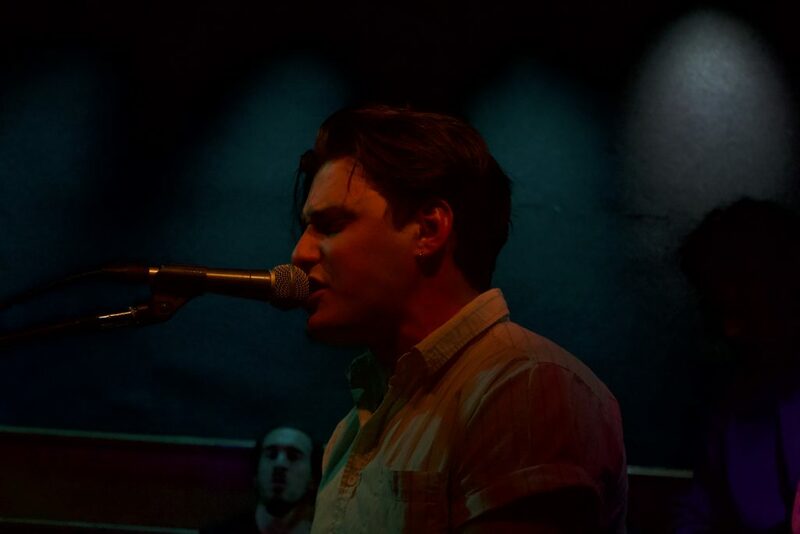 It was as if the combination of frontman Alexis Marshall’s aggressiveness and the foreboding instrumentation that accompanied him unleashed the inner animal in everyone. But before that could happen, the crowd was subjected to two opening bands. First up was Ganser, a local act that seemed to fuse post-punk with noise rock. 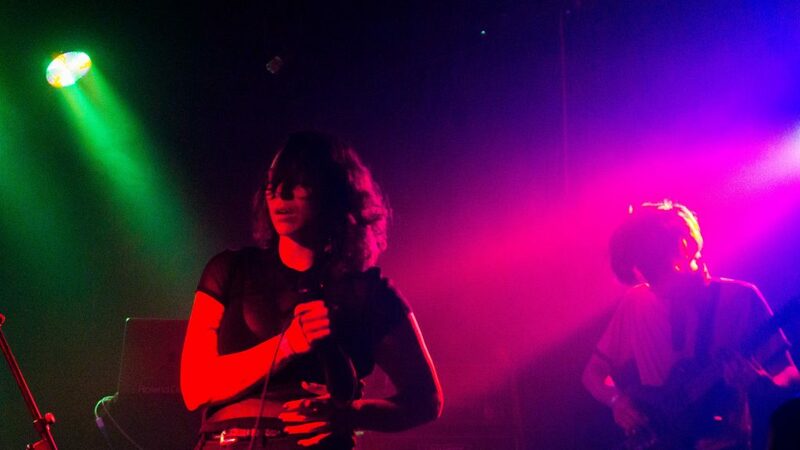 Their set was dark and moody, as vocalist Nadia Garofalo supported her speak-singing with animated facial expressions and hand gestures. 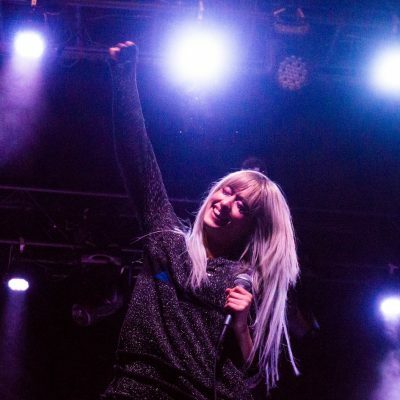 Her vocal style immediately prompted comparison to Debora Iyall of Romeo Void (particularly on “Never Say Never”), though their musical composition was more akin to that of Sonic Youth. Guitarist Charlie Landsman stood out immediately due to his choppy, unbridled riffs and wild thrashing. This carried the band into the noise genre, often creating that wall-of-sound effect. Kentucky four-piece Jaye Jayle was next. With the deconstruction and subsequent building of their compositions, they stood out to me as a true noise rock band. Most of their songs felt like the sonic equivalent of someone coming toward you, with paired vibrations from the bass and drums penetrating every part of the body. Vocalist Evan Patterson’s impossibly low and husky tone combined with generally dark lyrics elevated the instrumentals, forcing one’s body to sway like a pendulum. The band even incorporated a saxophonist, and all I can say is that I have never heard a saxophone make those sounds before. Overall, Jaye Jayle was simple and droney, but incredibly impressive. Now, for the feature presentation: Daughters. 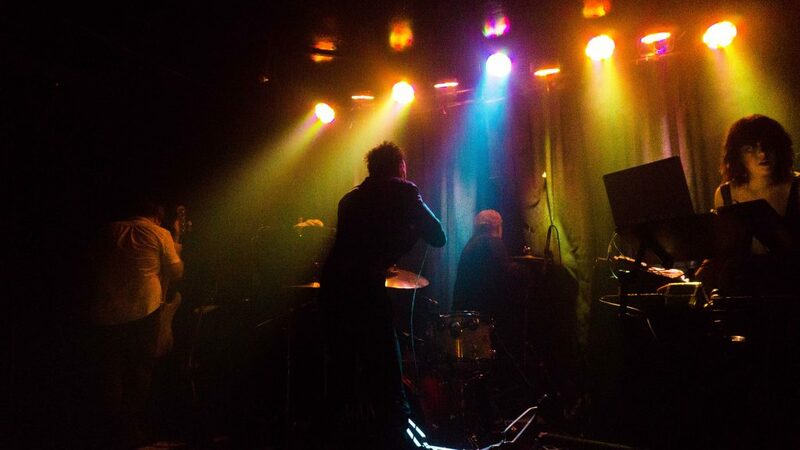 Six band members came on stage, most notably Marshall, who was wearing a black suit and button down shirt. Marshall screamed “No talking!” at a man in the front row, and then immediately launched into their first song, which was jarring. The red strobe lights and Marshall’s demonic wrist movements established the scary movie vibe, and the fact that Marshall kept grabbing people and yelling into their faces made it all too real. The energy of the crowd was animalistic, ensuing in moshing that was definitely dangerous. With their newest album You Won’t Get What You Want having received a rare perfect score from the Internet’s Busiest Music Nerd Anthony Fantano, any breaks in their set were stifled by audience members yelling “10/10!” One could tell that Marshall hated this. Or maybe that was just part of the act. The band powered through their set, some highlights including “Long Road, No Turns,” “Satan in the Wait,” and “Daughter” all from their new album, during which Marshall’s antics continued. He deep throated the mic, wrapped the cord around his neck like a noose, and spit constantly. Whenever he took a sip of water, he didn’t swallow, instead letting it drip down his face. At this point, he had ditched his suit jacket and was down to his unbuttoned shirt, exposing a white tank top. As he sang, he ripped his undershirt, letting the audience take it entirely off. 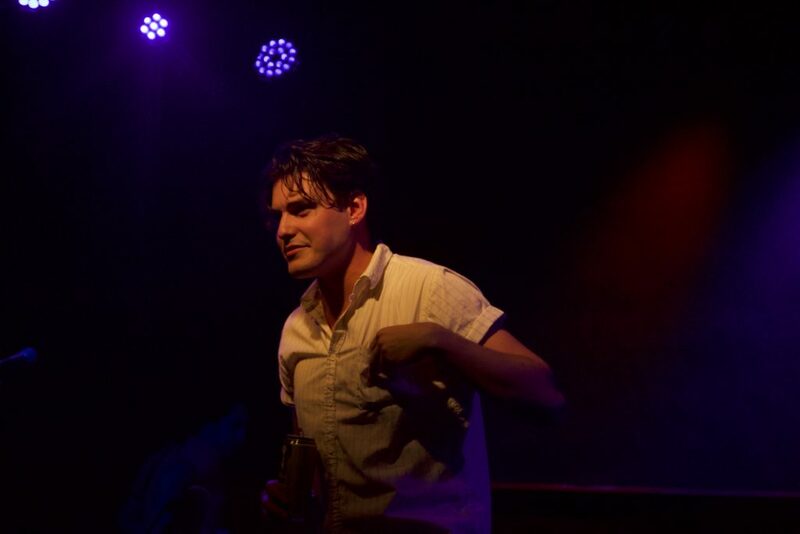 Clearly on a roll, he then grabbed the hand of an audience member, sucking his fingers in a manner that can only be described as sexual. 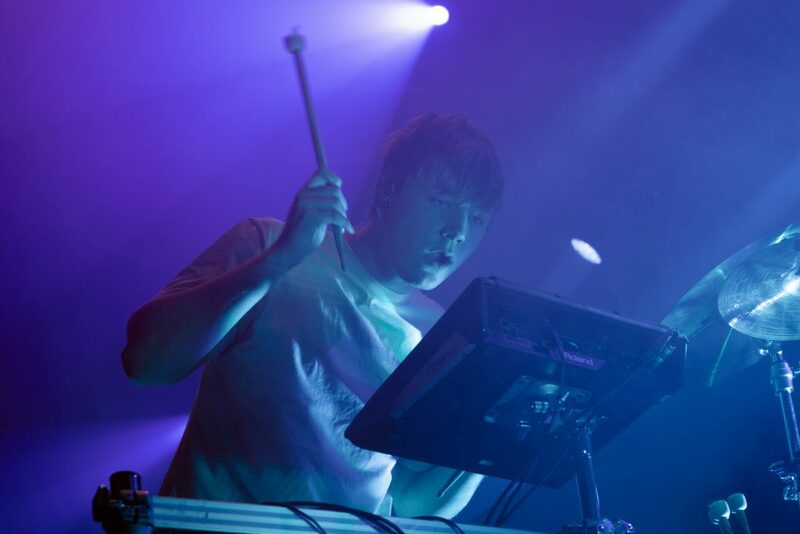 By the end of their last song, he began to kick and hit his band members, knocking over the cymbals of the drum set and unintelligibly yelling at the crowd. It was extremely entertaining, but also a cause for slight concern. On the train home , I looked more into Marshall to try and determine if his violent stage personality was all an act. The answer is yes, after finding on Instagram that he is happily married with two adorable sons. I have to admit, looking at pictures of him enjoying Christmas lights with his little family definitely made me feel a little less violated by the experience. Since John Mayer’s 2003 hit is still the first result when googling “Daughters,” it would be an understatement to say that they deserve more recognition for their innovative-yet-horrifying music – and yes, visceral performance. Indeed, seeing Daughters live was like watching a horror movie, but maybe I didn’t want to look away after all. It was just too damn captivating. 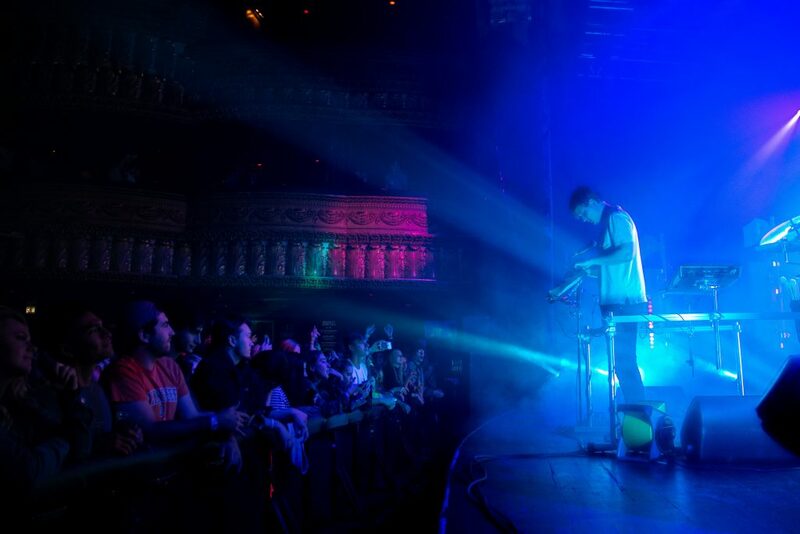 Lava lamps, as defined by Wikipedia, are “a decorative novelty item.” As indie pop duo slenderbodies performed their set at Chop Shop in front of three lava lamps, it became clear that slenderbodies are the lava lamps of music. I dig lava lamps! Most people dig lava lamps. There’s nothing to hate about lava lamps. Sure, lava lamps might not be life changing like the light bulb, but they still have a purpose. They’re bubbly. They’re colorful. They’re the type of thing you put on and then forget that it’s on but everytime you remember it’s on you’re like “Ahhh. Pretty.” A lava lamp can even make your day. Max Vehuni and Ben Barsochinni, both dressed in black jeans and black t-shirts, met center stage to play the sickeningly sweet opening guitar riff from their track “Gray” behind the rainbow lettering spelling out “slenderbodies.” And of course, the red and green lava lamps were there too. 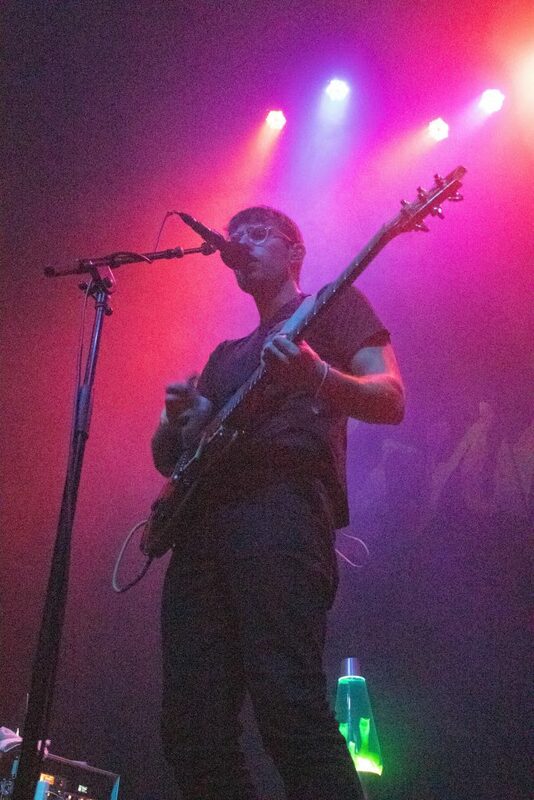 Before breaking into the chorus, lead singer Max announced, “We’re slenderbodies and we came to rock out. Dance a little bit.” And the audience did dance–a little bit. Everyone in the open standing room of Chop Shop couldn’t help but sway side-to-side and bob their heads. Lead singer Max’s persistent falsetto and the group’s consistently catchy guitar lines are infectious. 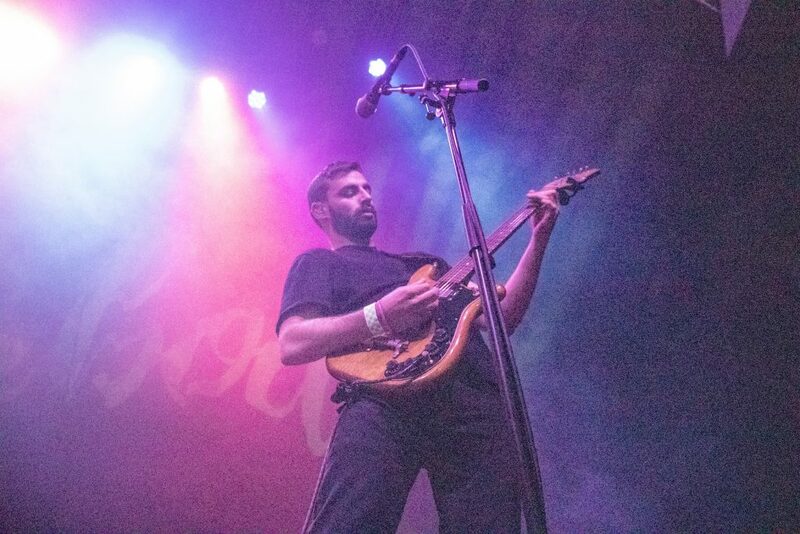 In what was the last show from their first headlining tour, slenderbodies milked everything they could from the audience. Max serenaded the mic as Ben took every guitar solo as an opportunity to approach the audience and smirk at the phone cameras fans shoved into his face. This level of fun is never fully realized on slenderbodies’s recorded discography. From the group’s first project sotto voce, they played songs such as “one of us” and “homestead” which ooze nostalgia. The groups other two EPs, fabulist and fabulist:extended, continue this aesthetic. 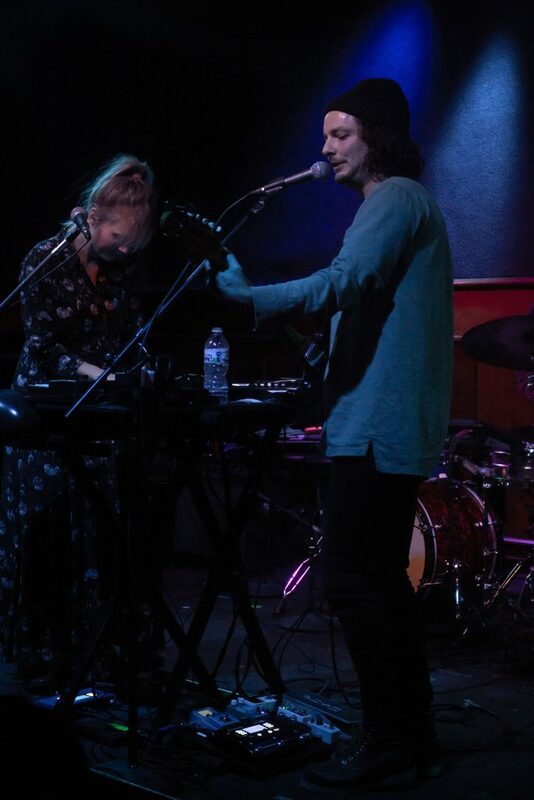 Their song “anemone,” which is their most popular single, literally has Max nostalgically singing “ I like it better underwater,” reminiscing on escaping to a place where “you’ll never get the best of me.” These songs were all fun live and they’re enjoyable at home, but they also all meld together. 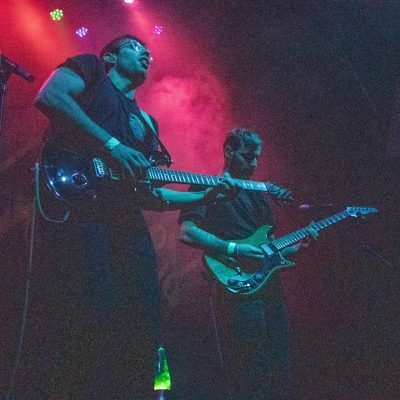 Slenderbodies performed their own renditions of songs from Britney Spears, Sade and MGMT, each of which fit their sound so seamlessly it could easily be pulled straight from any of their three EPs. 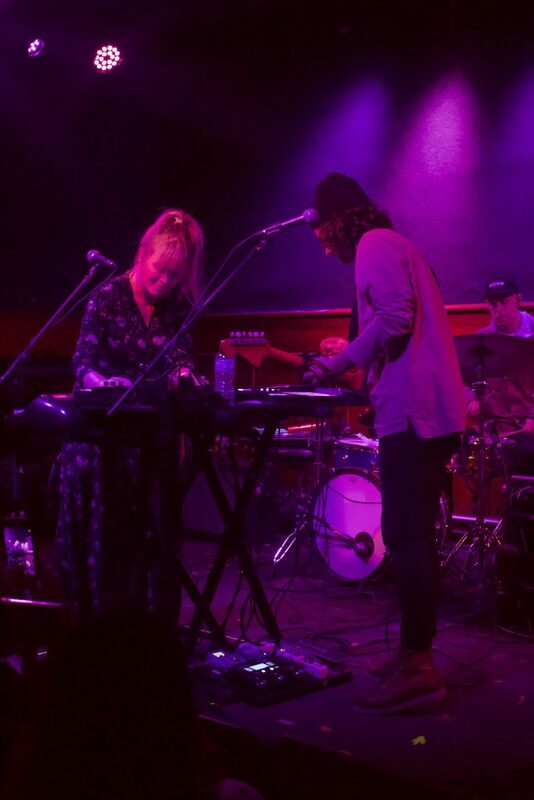 At the end of the performance, they played an unreleased track “King” from their new EP soraya set to release later this year. The track was good! But if they hadn’t told me it was new material I wouldn’t have known. This is where I bring up the lava lamp. A lava lamp doesn’t change. Its colorful bubbles continue going up and down in the same exact way over-and-over. But you still like looking at it. All music doesn’t have to be lyrically mind-expanding or so musically game-changing that the sounds aren’t fully recognizable as music. There’s a place for that too, but when I’m sitting down to do work or needing to go to bed or just wanting to brighten up my day: there’s the lava lamp. Max and Ben are gifted performers and it’d be awesome to see them expand their stylistic repertoire. But if they don’t, that’s fine too! So turn on one of their EPs –it doesn’t matter which one– and maybe you’ll fall for slenderbodies’s charm. 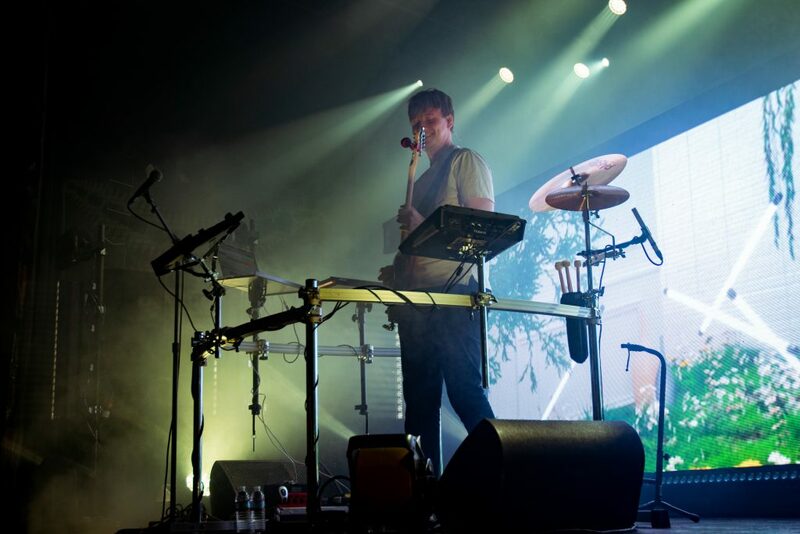 Los Campesinos played a high-energy, though unlucky, show at Thalia Hall on Thursday. 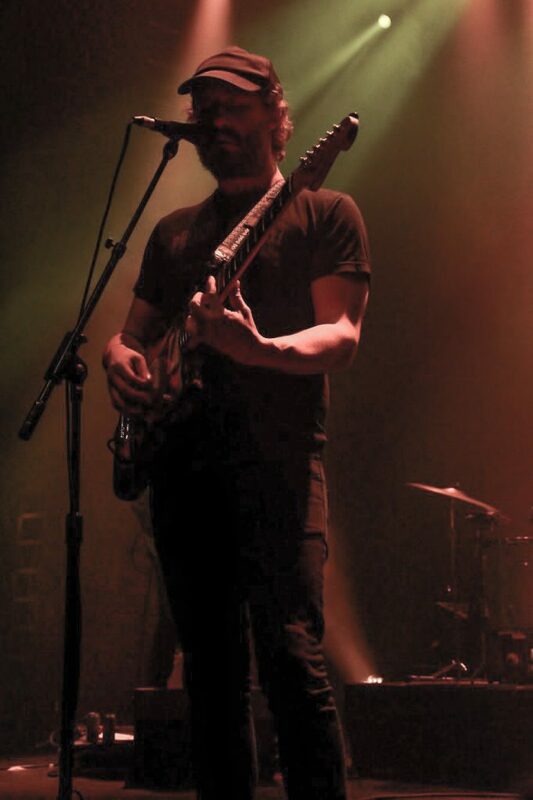 As lead singer Gareth David explained, half of their gear was stranded somewhere in Oklahoma. 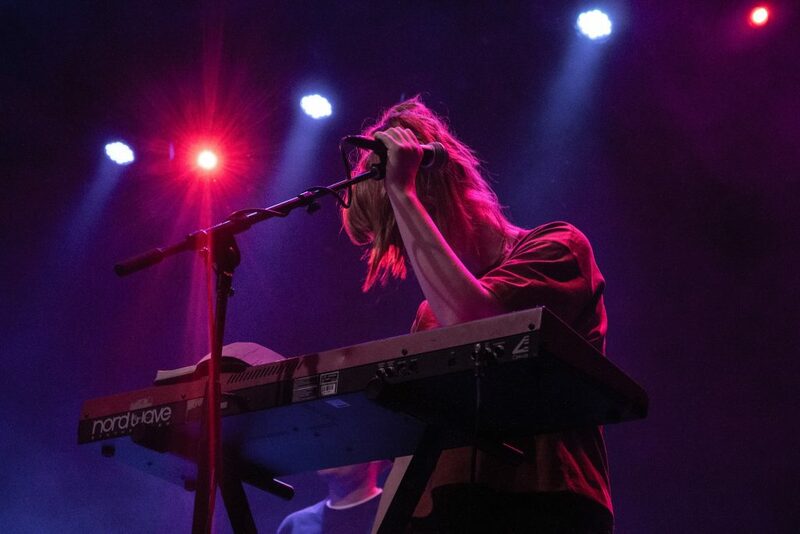 The indie-pop group didn’t seem to be too bothered; their set was long, dedicated, and peppy. 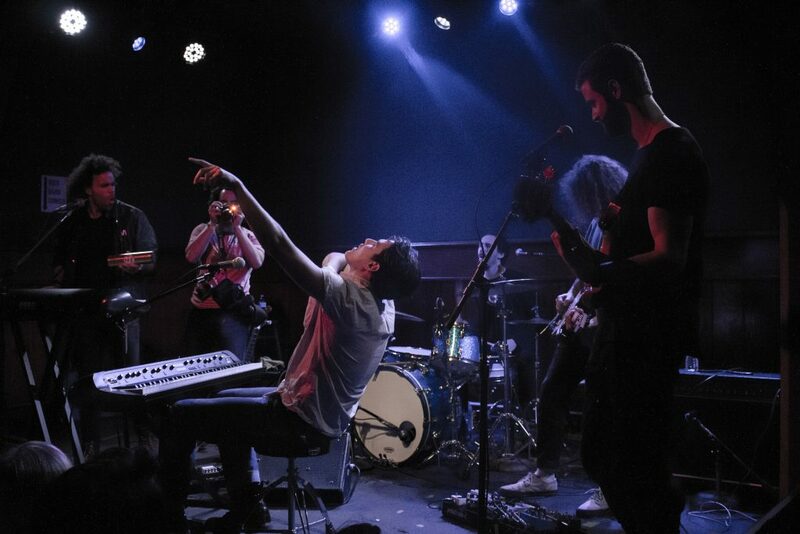 On the tenth anniversary tour honoring their debut album Hold On Now, Youngster, the group pushed themselves on borrowed instruments and had a great performance. Adult Mom, a queer rock band, played a solid opening set. 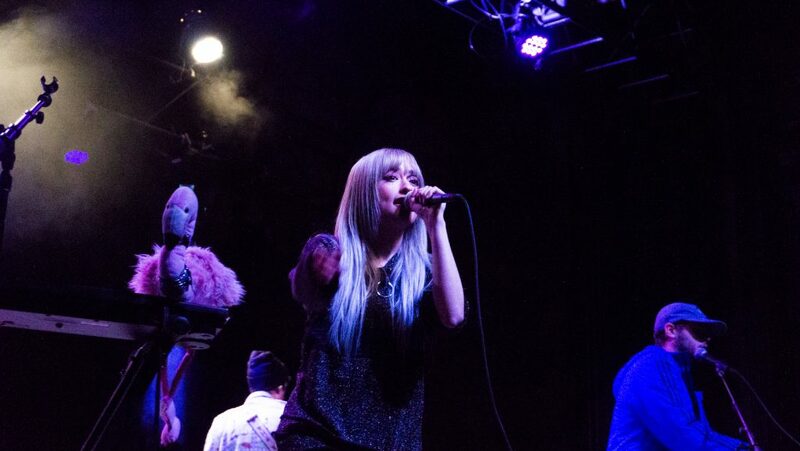 Their quirky, fun style works well in a venue as intimate as Thalia Hall. “Told Ya So,” “Route ‘59,” and “Full Screen” were great examples of the band’s smart instrumentation and catchy hooks.“First Day of Spring” was a slight tonal shift, paring the sound down to its singer-songwriter origins for the first verse. Stephanie Knipe’s lyrics can stand up to this minimalist arrangement, but the band was at its best with the full rock setup. Knipe’s semi-solo moment (the lead guitarist was the only other performer on stage) was the first time where the acoustic guitar could actually be heard. It’s a unique part of their instrumentation, but it practically couldn’t be distinguished on any other song. The gesture to the band’s start as a solo act, though, is a thoughtful one. 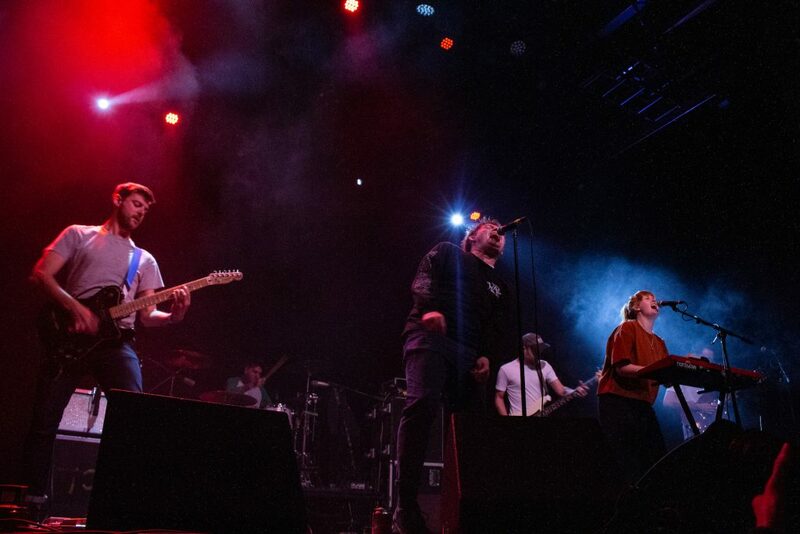 Los Campesinos opened with “Ways to Make It Through the Wall,” and right from the beginning the energy onstage was impressive. 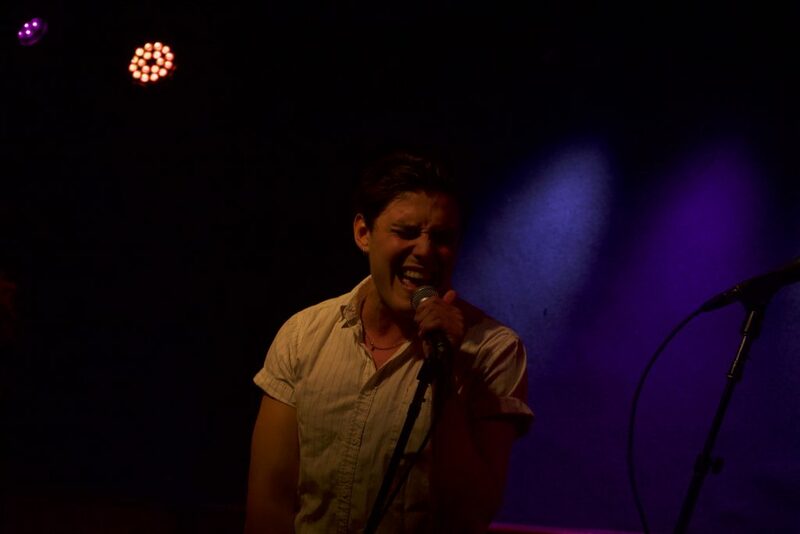 Gareth David, lead vocal, sings with his whole body. 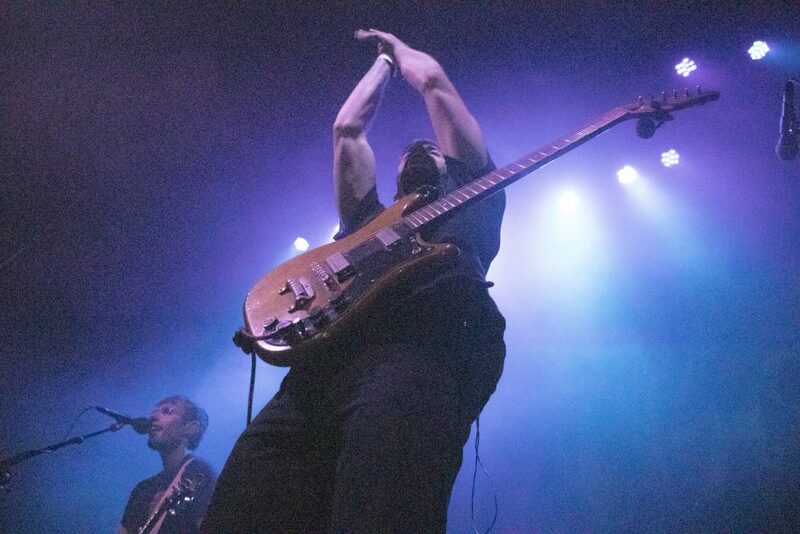 While some of the band members were fairly stationary, like Tom Bromley on lead guitar, singer Kim and bassist Matt were dancing, pacing, and sustaining the high energy that characterized their performance. 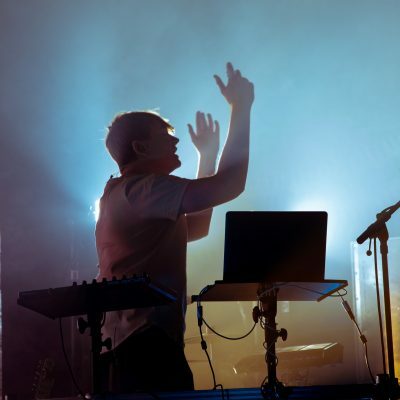 Their instrumentation was tight, mostly synth-based and very pop-influenced. 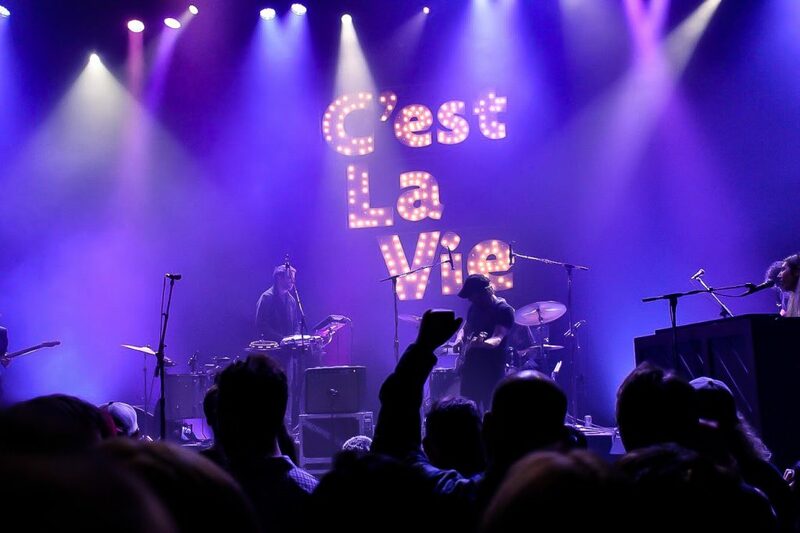 For their set, they chose a great mix of old and new and showed an interesting cross-section of the band’s ten-year career. 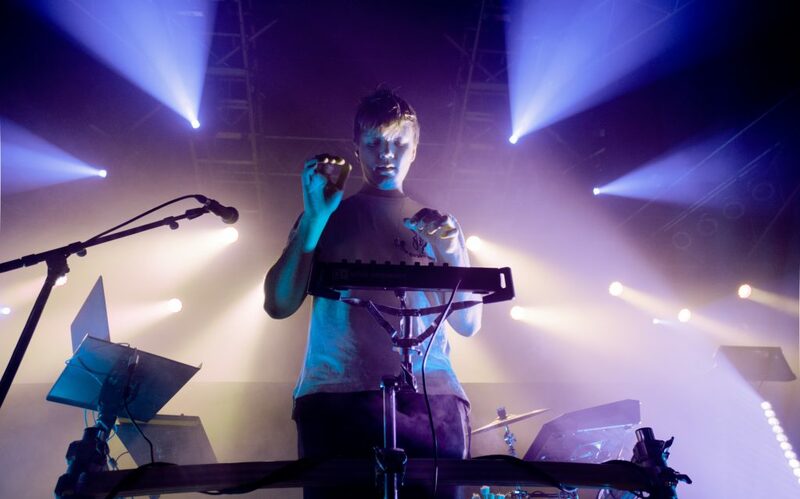 Despite some changes to the musicians, Los Campesinos has maintained their distinctive brand of indie-pop. That same distinctness was partially what made their animated set start to drag slightly towards the end. The energy of the fans was unceasing, but the synth runs and heavy guitar feedback started to sound the same as the band got deeper in the setlist. Gareth’s forceful singing also made the lyrics (usually clever and interesting) more noise than sound unless sufficient attention was given to parsing them out. That said, the vocal contrast between Kim and Gareth added a cool dimension, even at the most lazy listen. “What Death Leaves Behind” showed an interesting synth-guitar interplay, and “The Sea is a Good Place to Think of the Future” had a great guitar line, but for the most part the most catchy runs were electronic. The excitement of the crowd was contagious, though. 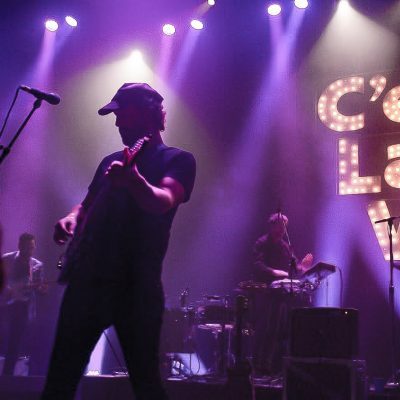 The audience kept up with the band’s energy and danced, sang, and shouted their way through an extended, involved set. How many shrimp do you have to eat before you become a hit internet sensation? It’s pretty typical of bands/artists that gain fame from memes to not know what to do with that fame and end up falling off. I mean, when was the last time you heard Mason Ramsey do something? That being said, Kero Kero Bonito had every intention of keeping the sound that claimed their fame on their sophomore album Graduation; an album filled with infectious hooks, cutesy production with a lot of depth, and enough songs to satisfy those looking for more fun. This begs the question: where do they go from here? With the release of their new EP, TOTEP, into their new touring album, Time ‘n’ Place, KKB proves that their success was not a mistake, but that they are a living, breathing band with every intention of coming into their own. On their latest wave, KKB has adopted more noisy sounds while still keeping their branded soft, floaty, sweet, optimistic flair. Whether this is provided from Sarah Midori’s softer voice, or the newer, fresh, catchy melodies throughout the song, or the random samples that creep on you while you listen, one thing is for certain: KKB shouldn’t have much to prove on this new tour. 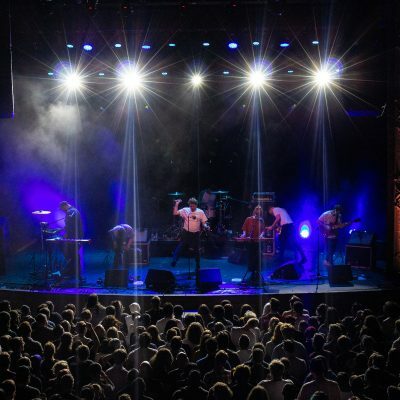 From their promotion and their seemingly new direction that has received much approval from audiences and critics alike, KKB has had no trouble selling out venues and drawing a large crowd in America. However, I can’t say that you will not be surprised by what you will see. One thing that instantly caught me off guard was the diversity of the crowd. Both the opener, Tanuki-chan, and KKB are active in a current wave of Asian women in rock music, and a larger movement to push more representation in the music industry, enabling more people to come to concerts and feel comfortable in more public spaces. All of this resulted in an atmosphere that one couldn’t but feel safe and happy to be a part of. Tanuki-chan’s opening set was the perfect mood setter. Her fun, catchy grooves and soft melodies was a great way for audience members to leave their worries at the door and focus on the music. What came next was a sound that I think nobody could have predicted. KKB trickled onto the stage, one by one, with their opener track on “Time ‘n’ Place,” Outside, and their energy completely encapsulated the room. This band sounds like it’s changing; that they want to change. Each band member to their own right displayed a level of tight-knit competency that allowed Midori to move freely around the stage and interact with the audience. While they played the songs that people knew them for, they sounded different. But one thing was for sure: KKB puts on a show that you should be a part of. There was one moment towards the end of the concert when she addressed the audience to state how she couldn’t believe that she was on a stage performing in front of an audience like this, and how fortunate she was for her situation. To which she gave a piece of advice: “If you want to do something, just do it. It will all work out soon.” I think that this very much sums up the night, and the ethos of KKB. 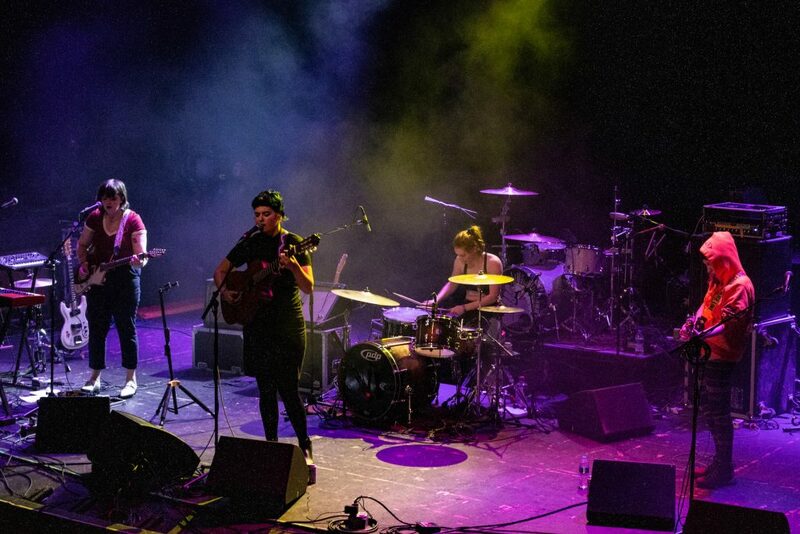 This new direction they’re heading stands as a milestone for them, a chance to cement themselves in musical history as a band that is pushing for more representation in music. Yet, while their future is completely unknown, Midori and crew are living in the moment, approaching the future with an optimistic smile on their face.